"Kia" redirects here. For other uses, see KIA. Kia Motors Corporation, commonly known as Kia Motors (Hangul: 기아자동차; Hanja: 起亞自動車, IPA: [ki.a], lit. "Kia automobile"; stylized as KIɅ), headquartered in Seoul, is South Korea's second-largest automobile manufacturer, following the Hyundai Motor Company, with sales of over 3.3 million vehicles in 2015. As of December 2015[update], the Kia Motor Corporation is minority owned by Hyundai, which owns a 33.88% stake valued at just over US$6 billion. 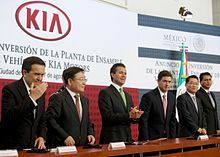 Kia in turn is a minority owner of more than twenty Hyundai subsidiaries ranging from 4.9% up to 45.37%, totaling more than US$8.3 billion. As of December 31, 2015[update], the Hyundai Motor Company owns a 33.88% stake in Kia Motors. Likewise, as of December 31, 2015, Kia Motors is owner in 22 different Hyundai companies. Its ownership percentages range from 4.9% up to 45.37%.